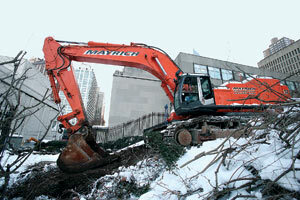 An excavator grades and clears the site where the new Fordham law school building and residence hall will rise. The building and residence hall were designed to engage the Lincoln Center for the Performing Arts while maintaining a distinct Fordham identity. On Feb. 3, Fordham embarked on a journey to create one of the nation’s most advanced teaching, research and residential environments. On that wintry, wind-whipped Thursday, construction crews broke ground on a new home for the Fordham School of Law and an undergraduate residence hall. The $250 million project calls for a 22-story building clad in a curtain wall of cast stone, metal and glass. The school will occupy the lower nine stories while a residential tower for 430 undergraduates will rise above. The project is the opening movement of Fordham’s ambitious $1.6 billion plan to transform the Lincoln Center campus into a state-of-the-art facility of national prominence by 2032. The new Fordham Law building and residence hall will front on 62nd Street between Columbus and Amsterdam avenues. When it opens in 2014, the former law school structure will be used to expand professional schools pending future construction projects. “This is a signal moment in Fordham’s history,” said Joseph M. McShane, S.J., president of the University. “Construction of the new law school and residence hall at the Lincoln Center campus is a key step in the transformation of the University and of Jesuit higher education. That investment began to take shape the moment Joe Mauro of Mayrich Construction drove his four-claw backhoe into Robert Moses Plaza. Reversing direction, the bucket came up with a load of snow, broken concrete and soil, which it deposited near the plaza’s interior. Mauro’s 100-ton excavator soon had destroyed the stairway leading from the plaza to 62nd Street, leaving in its wake an packed-earth construction ramp. Meanwhile, other Mayrich workers used propane torches to dismantle the wrought-iron fence that separated the campus from the street. Second-year Fordham Law student James Haffner paused to watch the construction. “It’s good for the school, given our need for space and our growing reputation,” Haffner said. “I know [students]will have to deal with the construction, but there’s always something being built around here,” he added. “In the scheme of things, I’d say this is a more important endeavor than Fashion Week,” which was setting up across the street. Designed by Pei Cobb Freed & Partners, the 468,000-square-foot law school building will more than double the school’s program, event and office space. The structure, which is designed for LEED Silver certification, will feature a two-story atrium, moot and trial court facilities and a 562,000-volume law library. With its Lincoln Center location, it promises some of the best views of New York City. The expansion has been much anticipated at a campus that has struggled with space limitations for decades, Byrne said. When the Lincoln Center facility was built in the 1960s, it was designed to accommodate 3,500 students. Today, the campus is bursting at the seams with roughly 8,000 students, four graduate professional schools and an undergraduate college. Compared to other Manhattan-based universities, Fordham ranks low—at barely 100 gross square feet per student. When the comprehensive development plan for Fordham-Lincoln Center is fulfilled in 2032, the campus will serve more than 10,000 students with 1.5 million square feet and 1,500 new residence hall beds, Byrne said. Given the negative publicity heaped upon New York City-based universities that have claimed land for development through eminent domain, Byrne said, Fordham is “fortunate in that our total expansion will be accommodated entirely within the boundaries of our Lincoln Center site. “Our challenge is to develop our space into a vibrant vertical campus,” he said. 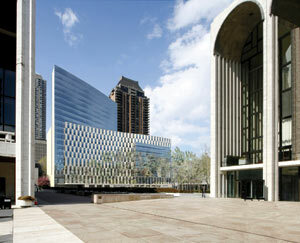 The entire Lincoln Center development plan was approved by the New York City Council in June 2009. The University worked diligently with residents, Community Board 7 and elected officials to create a plan that would integrate the campus with the surrounding neighborhood. According to architectural design partner Yvonne Szeto, much detail went into designing an aesthetically pleasing structure that engages the nearby Lincoln Center for the Performing Arts while maintaining a distinct identity for Fordham. • 349,000 square feet of program space and 361 rooms. (The current structure offers 174 rooms and 160,000 square feet of program space.) The new building will double the number of faculty/staff offices and triple space for student services and programs. • 26 audio visual-equipped classrooms, lecture halls, seminar and conference rooms. • an energy-efficient central plant that integrates temperature and lighting controls. • four passenger elevators and three service lifts. • larger dining areas, faculty and student lounges with serpentine stairways, and a reading room. Interior finishes include terrazzo floors and limestone-clad walls. The new 430-bed residence hall atop the law school will feature one to three beds in each room, five Integrated Learning Center suites, a dance studio, entertainment rooms, a laundry and an undergraduate dining hall that accommodates 130 students. The residence hall is scheduled to open in the fall of 2014. On May 2, the University will hold a ceremonial groundbreaking featuring Fordham administrators, local dignitaries and construction officials. • and a theatre for the dramatic arts. When completed, the new Lincoln Center campus will include active street uses accessible to the community, such as a gallery, bookstore and café. The development plan for the campus will translate into 4,500 to 5,000 construction jobs over the term of the plan and about 520 permanent and 200 contract jobs.